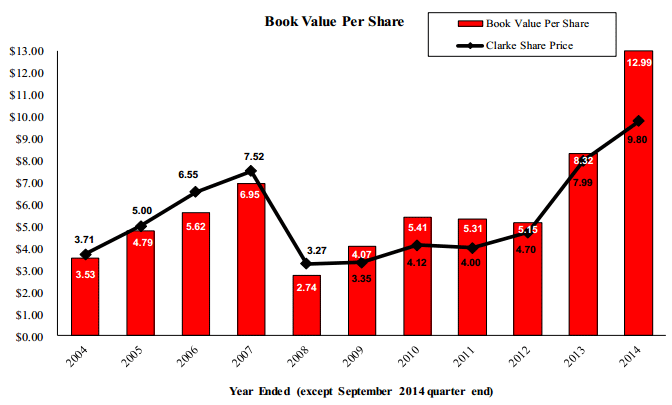 Clark Inc: the Canadian Icahn at a discount? As is visible the company is trading a decent discount to NAV, but a discount less than 20% is ordinarily not enough to get me interested. Unless the investments of the holding company are capable of outperforming the market a holding company deserves to trade at a discount because it has overhead costs and there are usually tax inefficiencies. Tax inefficiencies seems to be minimal at Clarke because it doesn’t pay taxes on capital gains or dividend income. It might have to pay income taxes when the pension benefit asset is realized. I wasn’t able to figure this out with certainty, but I do think it is probably that they have to pay 31% in income taxes when it is realized (if I have a reader that knows this for sure, that would be nice). Assuming that they need to pay taxes this would reduce NAV by CA$9.3 million. The negative value of the overhead is a bit though to figure out since the company used to own operating subsidiaries that have their results consolidated. George Armoyan got paid close to a million dollars in pension benefits last year, but since he is now only the chairman of the board and not the CEO that might not continue. But the new CEO is obviously getting paid, they have a CFO and probably some other staff at the holding company level as well. And there is of course an auditor to pay, and I assume they have an office somewhere as well. At least CA$2 million in yearly operating costs is probably an optimistic estimate. Capitalize these costs at a 10% discount rate and we have another CA$20 million liability that is missing from the NAV. If we would include this and the taxes in the calculation the discount would be a meager 7.4%. This looks like a pretty decent result, and it is. Book value increased at a 14.3% CAGR while both the S&P/TSX and the S&P 500 managed something closer to 5% during this period. While this sounds pretty impressive I’m actually a bit skeptical whether or not this result is attributable to skill instead of luck. If we ignore the past two years where Clarke posted phenomenal results the company would have performed roughly the same as the S&P/TSX for an eight year period but with more volatility. Not being able to beat the index for an eight year period sounds pretty crappy to me, but I might be overly harsh? It doesn’t inspire confidence. If you think George Armoyan is able to beat the market Clarke is probably a pretty good investment, especially if he is able to beat the market at a significant clip. If he is unable to beat the market – and unfortunately that is for most investment managers the case – the company is probably just marginally undervalued. To be fair: I haven’t included the impact of the share repurchases in my calculations. 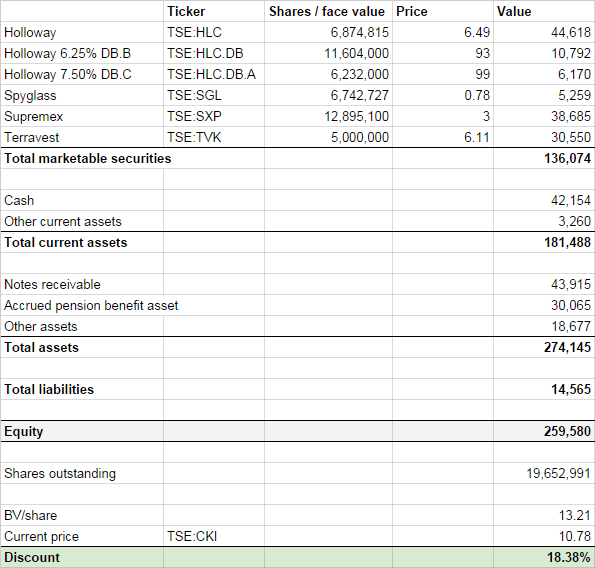 Buying back approximately 5% of the outstanding shares/year at a ~15% discount (taking taxes on the pension asset into account) should result in a little bit of alpha. It’s not very meaningful though. This entry was posted in Research and tagged CKI.TO on November 20, 2014 by Alpha Vulture. Good analysis. FWIW I believe their pension plan is somewhat more overfunded (up to 50m according to the latest quarterly but an asset ceiling caps this to 30m) . Not really relevant for the valuation but how would you take this into account? Second: have you looked at their portfolio holdings? Most notably Holloway, Supremex and Terravest? Missed that one. Would increase NAV with $20 million since the asset ceiling is just an accounting adjustment. The money will eventually go to the company once the pension plan has paid all it’s obligations and it can be invested in the mean time. Would increase the discount to book value (pre-adjustments) to 25%. PS. Did look at their portfolio holdings superficially. Didn’t look expensive. They can probably buy annuities to fulfill their obligations and then return the remainder of the cash to the company. But for the intrinsic value it doesn’t matter a whole lot if it takes a lot of time because the excess money at the pension fund can generate a good return in the meantime. I just wanted to clarify the valuation of the pension fund. As Pietje pointed out, there is another $20M or so of pension surplus that is not included on the balance sheet. As the asset is not booked, neither is the tax liability. Thanks, this obviously makes the company a little bit more attractive :). Missed it because latest quarterly showed a relative small deferred tax liability, but apparently they do net their deferred tax assets and liabilities. So instead of substracting $9.1m we should be adding ~69% * 20m for the pension surplus. Makes it slightly more attractive but unfortunately the market already compensated for that today 🙂 Also the latest news is that they sold their Supremex stake for $2.90 / share. Also note that _if_ you believe they outperform the market their pension fund becomes more valuable. I’m not sure but I believe they more or less invest in the same stuff – their pension fund is also a large holder of Holloway common. I have never heard of the other companies. Down ~10% since post – much more than portfolio. They bought back 150k shares past two weeks. Together with pension adjustment as discussed in the comments should make this close to attractive for you, right?